Fresh mushrooms, whether they’re earthy tasting shiitakes or round, white button mushrooms, become condensed in flavor and texture when they are boiled. A moist-heat cooking method, boiling causes mushrooms to release much of the moisture they contain. 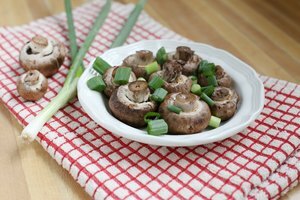 With a soft texture, boiled mushrooms may be used for soups, stews and sauces. Fresh mushrooms tend to have a lot of dirt stuck to them, so they require cleaning before cooking. Do not soak mushrooms in water to loosen the dirt. 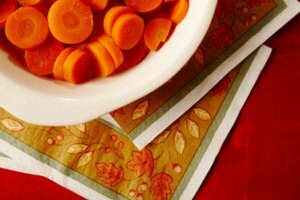 Because of their porous texture, they will absorb the liquid, turning them into bloated, muddy-tasting vegetables. Instead, brush off dirt with a soft brush or a damp paper towel. 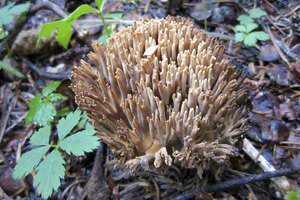 This technique applies to all mushrooms except for morels, which do require a quick rinse in water as their small holes make it difficult to remove debris. Boil mushrooms whole or cut into pieces. The larger the piece, the longer the cooking time. Once the water has reached 212 degrees Fahrenheit — when the water continues to bubble after stirring — add in the mushrooms. It takes roughly 15 minutes at a rolling boil to cook 1/2 pound of medium-sized mushrooms. When cooked, mushrooms darken in color and soften, although they retain their hale. Boil mushrooms in plain, salted water or add seasonings such as aromatics, dried spices or fresh herbs to give the mushrooms and the cooking liquid extra flavor. 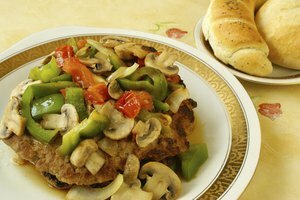 A splash of wine or sherry works well for mushrooms intended for tomato sauces or beef stew. 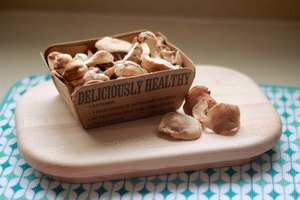 Dried mushrooms also can be boiled; because of the high heat and moisture, they do not need to be rehydrated before cooking. However, not soaking dried mushrooms prior to using means you can’t get rid of any grit on the pieces that adhered prior to dehydration. Ideally, soak the mushrooms in warm water to soften slightly then boil them. Dried mushrooms release a lot of flavor when boiled, so save the liquid. Boiled mushrooms have a velvety texture when cooked, and the strong, earthy taste of mushrooms is present in the cooked pieces as well as the cooking liquid. While cream of mushroom soup is a standby for boiled mushrooms, you may use boiled mushrooms in pasta sauce, stew or other soups. An easy way to use both the mushrooms and the cooking liquid is to add the cooked mushrooms and a small amount of the liquid to hot pasta, then toss with an egg yolk, cheese and cream for a fast, rich and umami filled dish.